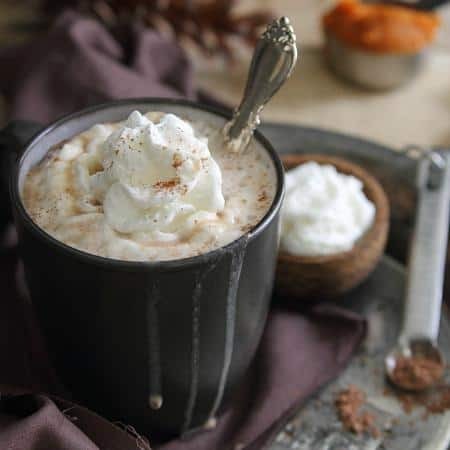 This pumpkin hazelnut hot chocolate is warm, comforting and the perfect thing to cozy up with as the weather gets colder. About this time seven years ago (wow, it’s crazy how fast time goes as you get older), I received an unsolicited home decor magazine in my mailbox. Married just over a year, I had packed up New York for Florida to be with Ulysses the day we returned from our honeymoon. We had a beautiful house, a pool in the backyard and life was good. Or, so I thought until that magazine arrived. Normally, I’d throw that kind of junk right into the garbage and not give it a second thought. For some unknown reason though, I opened that one. I can vividly remember looking through it on the couch as the sun poured in through the living room window. The door to the screened in patio was open while the late October 70 degree breeze flowed through the house, and I just lost it. I saw picturesque fall foliage setups with pumpkins, gourds and hay bales. I saw snowy covered front porches with monogrammed welcome mats. I saw people bundled up in cozy winter jackets, scarves and hats with cups of warm drinks in their hands and as the tears streamed down my face, I told Ulysses we needed to move back to New York, that I missed the “changing of the seasons”. Fast forward to present time and if you’ve read this blog for any length of time you know that I sincerely regret that decision. Twenty-five year olds shouldn’t be able to make life altering decisions like that. And while I love my family close by here, I love my quality of life a lot too. For six months during the barren wasteland of a New York winter, I’d give anything for that 70 degree breeze and sunny Florida sky again to be able to just be outside and active. All that being said, the first few weeks of fall in the northeast are magical. It’s still warm enough in the middle of the day where the heat has yet to kick on, but mornings and nights are filled with that deliciously fall crisp air. The trees are the most gorgeous display of colors, flickering through the windows as the leaves drop to the ground. And, of course, the arrival of cozy warm spice drinks becomes not only socially acceptable again, but your body craves them because it just “feels” right. It’s hard to make a pumpkin spice latte feel appropriate in 80 degree weather with palm trees swaying about. I much prefer creating those cozy comforting drinks at home so I can customize them to my taste and easily create the coffeehouse flavors and sweet aromas I love at home, my way. Even after trying to modify drinks in the coffee shops, they just never come out good enough to justify their inflated pricing. Hazelnut is my all-time favorite coffee flavor. Pumpkin is, well, pumpkin and of course a necessity this time of year. And chocolate just makes everything better. So with all three in this drink I can assure you, it’s a brilliant addition to your fall routine and a great way to reward yourself with a cozy treat. Tate+Lyle® Gourmet Beverage Syrups (available in the sugars aisle at Walmart and other retailers) are made with 100% natural pure cane sugar, are Fairtrade certified, and are the perfect in-home solution to flavored drinks. No more suspect bottles of liquid “who knows what” being pumped into your drink by some hipster barista. I’ll be enjoying quite a few of these as the days get shorter, the air colder, the tree branches more bare and the Florida blues start to set in. I’m thinking this drink might be just the thing to help me make it through this season. Combine all ingredients in a small sauce pot over medium heat. Whisk and bring to a simmer. Pour into mugs once hot and top with whipped cream. I would get caramel and hazelnut flavors and out them in my coffee. I am sweet and simple! Since I am not original! I would most likely use your recipe! It looks amazing!!!! Love this and love that there’s nothing artificial in it. I’d use the syrup to dress up the ordinary coffee! Great giveaway! In the dead of winter, I feel the same way about Florida :-) It is my dream to be a snow bird. Wow, that looks AHmazing. Running to the store to get some of that beautiful sugar!! This is my kind of hot chocolate. I love hazelnut! it’ll be one year on november 1st that we moved from Seattle WA to Madison, WI. Girl, you wanna talk barren wasteland of a winter? :) I think it’s hilarious that you don’t see your neighbors for like 4 months. . anyway, I hear you on those home decor magazines. . I can no longer look at those. . too beautiful and makes me wish I had a million dollars so I could buy everything for my house :P for my entry: I would make this pumpkin-hazelnut-hot-chocolate!!! I would use the syrups in coffee…perfect way to warm up on a cold winter day! Gina this looks so good! I’d love to have a big mug of this! Pinned! I’d use them for evening nightcaps and also bake quick breads with them! I can’t wait to try these syrups! I’d definitely use them to amp up my morning latte! I would reward myself by using the Vanilla syrup to make a vanilla latte in the morning, instead of my regular coffee. I would probably try it in coffee first. I would make it an ice cream topping! For sure in my black tea I drink every morning. This looks like the perfect afternoon pick-me-up! I would love to make a Hazelnut beverage similar to this one. This would be wonderful for cold winter days too. I would pour it over a big bowl of ice cream. Yummy. I’d put in in my coffee for a treat after the kids went to bed! I would add it to my oatmeal. I would use Tate Lyle syrup in my hot coffee to rewards myself sounds super yummy. I think this would be delicious in coffee and baked goods! I would add to my protein smoothies! I would use Tate+Lyle Gourmet Beverage Syrups to reward yourself by making myself a caramel latte with a whipped cream top. YUM! I would add it to my coffee. probably put in a smoothie or pumpkin latte. I would love to try it drizzled over ice cream! I would make me a ice cream sundae with it. I had no clue that Walmart carried such excellent quality syrups. I have yet to buy syrups, because I always worry about that content. I’m glad they’re right down the road. I will definitely try this recipe out soon. Would use them to flavor my steam milk. Would use it to flavor my tea. I’d use the syrup in milkshakes. I’d use it in milk. The Caramel Cane Pure Syrup looks delicious! I would put this in my coffee to give myself a morning boost. Love everything about this drink! I could sip on this all day! I didn’t know that Walmart sold flavored syrups like these. I’m a big latte girl and will definitely be using them to make some at home and save myself a few dollars along the way! I would use the Tate+Lyle® Gourmet Beverage Syrups in my homemade Caramel Hot Lattes! I would definitely use one of these syrups to make myself a Pumpkin Spice latte on a chilly weekend! I would use Tate+Lyle® Gourmet Beverage Hazelnut Syrup in a milk shake! WHO knew, indeed………….Walmart? I DO go to Walmart about once a month, they are the most close type of big store near me so I do pop in for household cleaning things AND they have some brand of sausages I am insane over.. AND they carry Old Home Yogurt which is THE Best and hard to find. Anyway I would use this syrup not only in my coffee, but why not on vanilla ice Cream? Why not let the kids put it in their milk? Why not add exotic flavors to a Flan? I would put it in my coffee every morning. I love everything about this. Pumpkin and hazelnut is such a great flavor for hot chocolate. Great for warming up on a fall day! I would reward myself with this tasty drink after raking the leaves! I will use Tate+Lyle® Gourmet Beverage Syrups as a reward for cleaning the house! I would reward myself with this drink just because I have earned myself a break and special treat. I might try drizzling some of the syrups over ice cream for a tasty dessert. I would use the syrups to reward myself by making a creamy hazelnut mocha coffee. I wonder if this wouldn’t be a lovely addition to iced tea as well. I would drizzle it over some low fat ice cream. I’ll bet it would be good in a milkshake! Very simply, I would add the syrup to hot black tea with milk. I would use them for all my teas that I drink. I would definitely use the caramel in my coffee. I would add it to my coffee, yummy! How would you use Tate+Lyle® Gourmet Beverage Syrups to reward yourself? I’d love to reward myself at the end of each week this winter by making myself some hot chocolate with the caramel syrup. Sounds so delicious! Can’t wait to try this stuff! I would use these to make vanilla steamers so I could enjoy a luxurious drink after a long day. Yum! I’d love to use the syrups in iced coffee! These would be awesome to use to make ice coffee. The Hazelnut in my morning coffee! i would use the vanilla in my tea to make a delicious drink! Ohh that would probably be good in a pancake batter! As much as I may be grumpy about the snowy weather, I think changing of the seasons is a wonderful thing. Fall is probably my favorite as we gear up for pumpkins and apples. 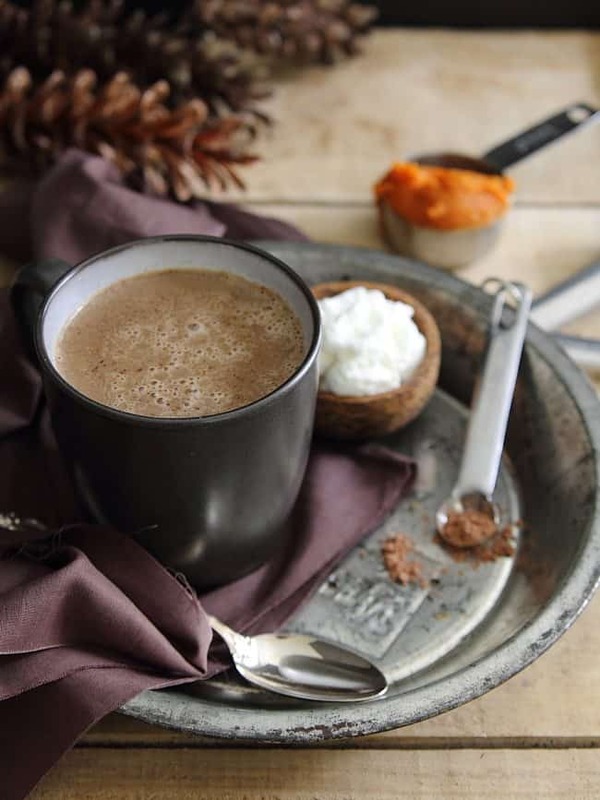 Loving this pumpkin hazelnut twist on hot chocolate! The caramel syrup would be a great addition to an apple pie! I would use it to flavor my coffee. I would definitely make a latte!!! I would probably add it to my Apple crisp! I would use the hazelnut to flavor my coffee. I’ve never used sugar syrup to sweeten any recipes before but I would try to add a little of the vanilla flavoring to a french toast batter or waffle batter. I wonder if it would work in popcorn balls? We make them every Christmas. I’d make my family hazelnut lattes. I would use Tate+Lyle® Gourmet Beverage Syrup to make myself a relaxing and delicious milky coffee drink after work to warm up during the winter. I particularly like the sound of the caramel variety. I’m a coffee lover…these syrups would be a wonderful cold weather, holiday treat. I would use it as an extra for a dessert for more flavoring! Maybe in my Apple Cranberry Caramel pie! I’d love to add the hazelnut syrup to my coffee to warm up after a run. Yum! I would use stir some of the caramel into a homemade latte after dropping my daughter off at preschool. I would probably add it to my coffee. I would love to add them to my hot chocolate drinks i make all winter! I would use the syrups in baking. Less sugar to add and more flavor. In the summer, iced coffee is the way for me to go. The vanilla or caramel would be awesome with simmered pears. I would use Tate+Lyle Gourmet Beverage Syrups as dessert toppings. I’d use it in custards and puddings. Hazelnut chocolate pudding, butterscotch caramel and rice pudding with vanilla and berry sauce. I’d try it in the pumpkin hazelnut hot chocolate. Then, I’d try the hazelnut in my coffee. Thanks. I would have to try it on my homemade apple pie. I’d add it to a morning latte! Yum! I would add it to my drinks or maybe just drink it straight. It’d be a sweet pick-me-up in my coffee! I would reward myself with the Tate + Lyle brand syrups by making a delicious vanilla latte with whipped cream on top. I’d like to try the syrups in a latte or drizzled over ice cream. I’d use their Caramel pure cane syrup as an ice cream topping to reward myself! I would use it when my daughter and her friends have campfire nights. I would use it on some pancakes. I love Hot Chocolate of any flavor. Using a product like Tate+Lyle that is made with natural cane sugar would make the beverage even better! I would use the Tate+Lyle® Gourmet Beverage Syrups to make hot chocolate that I can enjoy while I watch late night movies. I’d make the PUMPKIN HAZELNUT HOT CHOCOLATE recipe & treat myself to this every day. I would use it in coffee and in desserts. I would love to add the caramel syrup to my coffee and add some whipped cream and drizzle some chocolate syrup on it! I’d love to put the caramel flavor in some hot apple cider. I love caramel in anything! I would use Tate+Lyle Gourmet Beverage Hazelnut Syrup in anything to reward myself. I love hazelnut! I would add caramel to some hot chocolate. I would add it to some hot chocolate. I would add it to my coffee, and hot chocolates, both of which I drink fairly frequently in winter. I use Tate+Lyle® Gourmet Beverage Syrups to reward yourself by using them in beverages, flavoring home made yogurt, baking amd recipes. I already love hazelnut in my coffee, but I’ve recently discovered the pleasure of caramel in coffee too. So I’ll definitely put these on my shopping list! I would use it in hot chocolate for a special treat for my girls. Thank you!! I would use it in my afternoon coffee as a treat to reward myself for making it through the day! I would try mixing it in my favorite cake mixes, to make a new, delicious variety. There are so many different combinations that I could try! I would reward myself by adding vanilla to my coffee and hot chocolate. I would use the caramel syrup in my morning coffee to sweeten it, and give it flavor! i love to put the vanillia and the caramel in my hot chocoate for just an added kick! I’d add some to my oatmeal for a taste treat! I use vanilla flavoring in my sodas and my cocoa. I would put some of the caramel flavor in my coffee! Carmel in Spiked apple cider! I would use it in our hot drinks (coffee, tea, cocoa ect) on cold drizzly evenings. I would add these luscious syrups to a large dollop of whip cream, which I use to top gingerbread or lemon pound cake. I think the caramel flavor would enhance gingerbread. 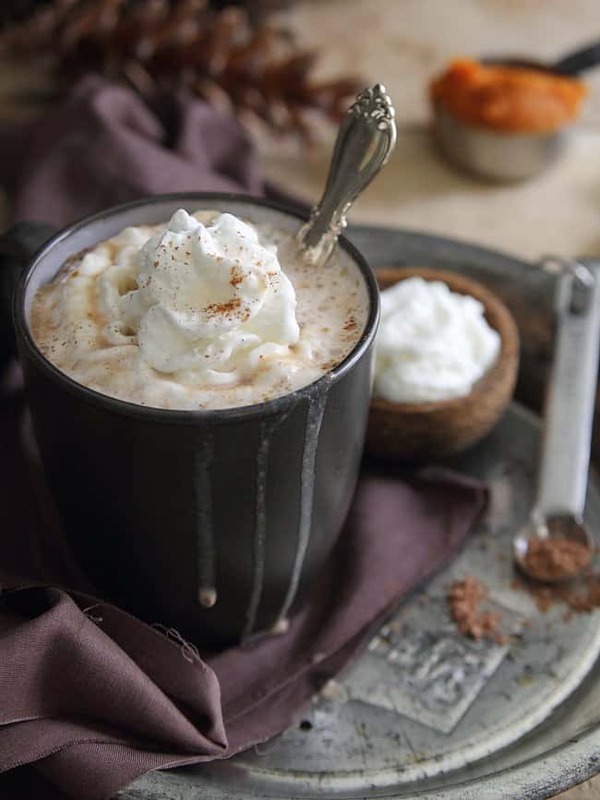 I love pumpkin and I love coffee so this drink is quite tasty I believe and if the chance comes to making it then it will be the first creation on my list. I’d put it on ice cream. I think I would make the Vanilla Cream Soda recipe. I would add it to pound cake or angel food cake. I would use it in coffee . I’d make cocktails out of it! I would use it to top all my favorite icecream deserts. I love flavored coffee so this would be a great addition for me to keep on hand. Thanks. I would use the caramel syrup in my coffee and top with whipped cream sprinkled with cinnamon. I don’t drink coffee so, I would use in hot chocolate or on top of ice cream. My husband would use in coffee. I think it would be good to use in a hot cocktail drink of some sort. I would use the caramel to make a Salted Caramel Frappe! I would like to use the Hazelnut syrup in my coffee. THE CARMEL SYRUP WOULD PROBABLY TASTE GOOD IN SOME HOT CHOCOLATE! THANKS! I would have friends over for coffee once all the holiday stuff is over. I would add some to my ice coffee. It’s not just for warm weather. I like the taste of caramel and chocolate and so would reward myself by mixing it in hot cocoa or homemade brownies. I would put it in my coffee and also for cocoa. Looks Yummy. I would put those syrups on my pancakes as well as other various hot drinks. I would spice up my milkshakes. I would use the caramel to flavor my coffee. I would use it in my coffee or tea. I can easily see myself considering a lovely, flavored cup of coffee, tea or chocolate (I’m thinking the vanilla syrup would work well for all three) as a reward for surviving a difficult day at work or doing well on a project or completing some long-standing project at home. Would be good for hot chocolate. I use them in club soda with a splash of milk. Yum! I usually have a cup of coffee after dinner, while relaxing. I’d like to treat myself by making my normal cup of coffee a sweet treat! I would use the syrups to reward my self by flavoring my coffee! I would use the Hazelnut in my morning cup of coffee! YUM! I would use the Hazelnut and the Caramel in nice warm glass of irish coffee after a long day’s work this winter. I’d use the Vanilla syrup to make a homemade hot fudge for ice cream! I would use the Hazelnut in my morning cup of coffee. I would use the caramel flavor in a chocolate fudge. I would use the vanilla flavor in my morning coffee. I would try it in coffee or hot chocolate, like you’ve suggested. Or maybe match the flavors with complementing liquers? I would like to try some of the caramel in some hot chocolate! I would use the vanilla in my hot chocolate! I would use it in my coffee and hot chocolate drinks. I would add the vanilla to my hot fudge topping and the caramel in my coffee. I would try the recipe here. It looks delicious. I’d like to try the caramel in hot chocolate. I would add extra flavor to my ice cream! I would use it in my chai tea! I would use these to make a hot carmel coffee before heading out into the cold for work each night. I know it sounds odd, but I’d love the hazelnut syrup in my pregnancy tea. Soo delicious, but not against dr recommendations! I would use Vanilla in my morning coffee. I love to relax with a caramel latte. I work in a high stress job. A shot of hazelnut in my after dinner coffee would help me unwind. I would love to try the Vanilla in my protein pancakes! I would use Tate+Lyle Gourmet Beverage Syrups to make myself a hazelnut latte after a long hard day. In my coffee when I’m home from work, relaxing time! I drink ALOT of coffee because I have twins who never sleep so I would use hazelnut and/or vanilla in all of my daily coffees! I would use the caramel in hot chocolate! I would mix them with my hot cocoa. I would use them to make a sauce for ice cream. I’d add them to hot chocolate. I’d put it in my coffee. I would use Tate+Lyle Gourmet Beverage Syrups in my lattes :) yummy! I would reward myself by adding Tate+Lyle Gourmet Beverage Syrups to my coffee instead of drinking it black. I would use the vanilla and caramel in my hot tea. I would use the caramel syrup on vanilla ice cream. I would use the Hazelnut to make a buttercream frosting! It adds a wonderful molasses taste in recipes calling for corn syrup, like pecan bars and chocolate frosting. I would use the carmel and hazelnut added to my sugar cookies for a subtle different tasste. I love trying new flavors in my coffee! I would like the hazelnut one in my coffee. Thanks! I would add it to my baking. What a great way to spice up my coffee. Thanks for introducing me to this product. First, I am so excited to see a syrup that is made from cane sugar and not HFCS! 2nd, I would use the caramel and the hazelnut to make a delicious hot cocoa or hot coffee or just topping for ice cream! mmm!!! I love flavored syrups in my morning coffee! I would use the chocolate and hazelnut flavors. I would use the syrups to add to my coffee, hot chocolate and give them a try in my hot tea. I would add some of the Vanilla Pure Cane Syrup to my hot cocoa. I would use Tate+Lyle® Gourmet Beverage Syrups to reward yourself with a Salted Caramel Latte after a hard days work. I would use the Hazelnut in my waffle batter for some yummy hazelnut waffles! Breakfast for dinner! I’d add it to ice cream. I have no doubt my pancakes would thank me for using any of the syrups on them. I don’t drink coffee, but I’m willing to give it a try in my hot chocolate! I’d use it in hot chocolate or maybe even on top of ice cream. I’d like to try it with my morning green tea. I would drizzle it over homemade vanilla ice cream. Yummy! Love everything about this hot chocolate. Especially the pumpkin and hazelnut combination. Thanks for sharing!